SpaFinder works with many spas, wellness and fitness centres across the globe to provide you with affordable pamper days and beauty and wellness packages. Simply click ‘Find a spa’ on their website, choose what you want from your spa day, whether that be to be pampered, to get fit, or any other alternative that’s available such as meditation, aromatherapy, acupuncture and much more, select your location and find a plethora of spas at affordable prices. The treatments and packages available at each spa are different but include everything from week-long weight loss retreats to specialised day spa treatments such as massages, manicures and pedicures, plus haircuts, detoxes and much more. There are thousands of participating spa venues available which offer fantastic wellness escapes. These are dotted around the world in some of the most beautiful and serene places imaginable including London, the UK, Europe and Asia. Choose your escape based on location or experience whether that be to be relaxed, invigorated, cleansed or pampered and take a break from your busy life to focus on yourself and your wellbeing. Many of the Spafinder partner venues provide services for couples, brides, and families, as well as those simply wanting to get away on their own to find their inner zen. If you know someone who’s in great need of a break, why not buy them a SpaFinder Gift Voucher/Card, so they can pick the spa retreat or pampering treatment that’s right for them? Once you’ve bought your gift card with your selected balance you can choose to print, email or post it to either yourself or your loved one. If you already have a spa voucher and aren’t sure what to spend it on, take a look at the ‘Get Inspired’ blog section where there’s plenty of information on the spas and spa treatments available. 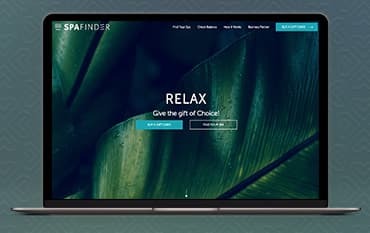 If the world of wellness and pampering is new to you, then you should start your exploration by heading to the SpaFinder ‘Get Inspired’ page. Here you’ll find a handy blog section where you can pick up beauty hints and tips, read up on specific spas on the SpaFinder recommended list, and swat up on all the latest trends in the wellness world. If you need some pampering but don’t know what’s going to work for you - this blog will give you the fresh ideas you need to get you on your way to physical and mental bliss. Treat a loved one to a blissful spa day with Spafinder voucher/gift cards. Choose from classic gift vouchers which can be sent in a gift box via post, accompanied with a custom message inside, or choose an eGift Voucher. These can be sent instantly by email or text alongside a design or personalised message which can be made by uploading a photo or video. e Gift vouchers can be printed if you or your recipient so wish. As well as this they also offer corporate gift vouchers. Treat your employees with access to health, wellness and fitness treatments at a discounted rate. Corporate vouchers allow recipients to choose their perfect wellness experience, they can be fulfilled electronically or physically, they’re transferable, customisable and never expire, and there’s no minimum order or set-up fee, making it an easy and affordable gift to present to your staff. Find the perfect nearby spa and wellness centre with all the facilities and treatments you could wish for. Simply browse the Spafinder location list and choose from many different places in the UK, Europe and Asia. Choose a spa day in London and escape the busy hustle and bustle of the city for some well deserved me time. If you need help and advice on which spas are best and what each location has to offer in terms of facilities, just head to the blog section where’s there’s plenty of information and support. If you’ve chosen to post a Spafinder gift voucher to either yourself or your gift recipient you’ll find delivery information and fees once you enter your chosen shipping address. Once your information has been submitted at the checkout, your shipping options will be calculated depending on where you’re located and you’ll be presented with delivery options and costs. Spafinder ships globally and in any currency for a market-rate conversion. Spafinder Wellness 365 Gift Voucher Cards are treated as cash and are therefore non-refundable. If you need to cancel your spa day please contact the spa itself using it’s contact details to cancel or rearrange. Each spa has a different cancellation policy. On each spa description page there’s an ‘address and info’ tab, click on this to find each individual spa’s opening and closing times. Spafinder, the gift of wellness and spa, launched its first online presence 15 years ago. Since then it’s developed into a huge brand known for supplying gifts, rewards, thanks, motivation and love to those who need it most. Their online portal helps you to save time and money while finding the ideal spa deal, with so many spa, fitness and wellness partners that offer everything from spa and hotel packages to retreats, wellness spas and holistic therapies. When you book a spa day or buy a spa voucher and use one of our Spafinder discount codes to save even more on your purchase, making it easier and cheaper to provide self-love, care and wellness to yourself or a loved one.